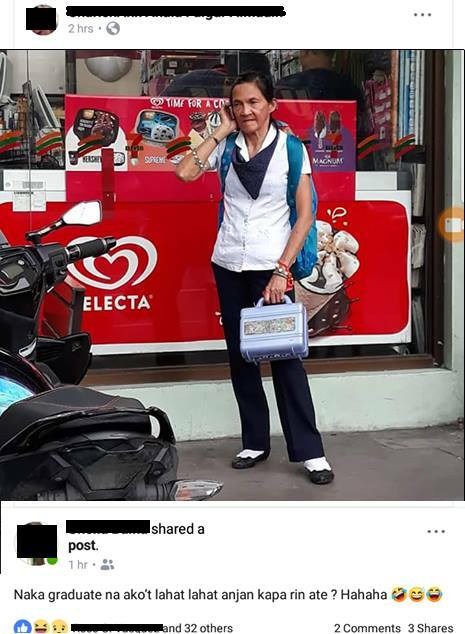 Netizen called out Facebook user making fun of a grandma wearing a school uniform. A comment stated that the grandma is not really a student but a person with mental disability. 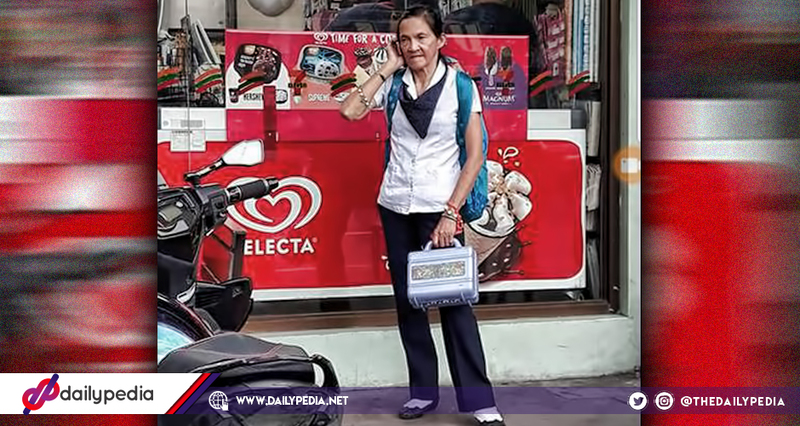 In a post by an unidentified Facebook user, a grandma was seen wearing a PATTS College of Aeronautics uniform, sporting a backpack and holding a lunch box while standing in front of a store. But that’s not what Isaac Reyes called out. In the caption, it said “Naka graduate na ako’t lahat lahat anjan kapa rin ate? Hahaha” which sounded like someone making fun of the old woman. Reyes took it negatively as he shared it on his Facebook profile, saying that those are the types of people that really make him angry. These kinds of posts REALLY get my blood boiling. You have NO idea what this woman’s story is or what she has had to go through in life. Yes, she appears older than most college students. He explained that maybe the grandma had different reasons as to why she’s still studying. And as no one knows her story, people shouldn’t make speculations. Have you thought that maybe she had kids early and wasn’t privileged enough to be able to go to school at the same age that you were able to? Have you thought that maybe when she was your age she couldn’t afford the books, fees, uniforms and commuting costs that it takes to go college? Or maybe she just wanted to do something other than go to college when she was younger. Maybe she wanted to create art. Maybe she started her first business. College isn’t the only pathway to success in life. Mark Zuckerberg, Steve Jobs and Richard Branson all decided it wasn’t for them. The point is, we just don’t know what her story is. And so we shouldn’t make assumptions. The netizen stated that “hundreds” of students shared and made fun of the grandma, which brought him to the idea that they were not studying hard enough as behavior is one of the things taught in school. The hundreds of college students who shared the original post (which has since been deleted) and made fun of her clearly aren’t studying hard enough in college. Because one of the skills they should be learning is how to behave appropriately in a professional setting. I SALUTE this woman for getting up everyday to seek out an education, despite the daily comments I’m sure she gets from some of her ageist peers. Pag gusto may paraan, pag ayaw may dahilan. Students saw the viral post and explained that the grandma, called Manang Fe, is not really a student. She is mentally ill.
Alyssa Mae Austria Pascua said that the uniform she’s wearing was of her deceased daughter’s. Manang Fe is not really a student. Wala sa tama yung pag iisip nya. Some say na yang uniform na ginagamit niya e sa anak nya na namatay (not sure). Pero I’ve talked to her and I can really tell na she needs help. Sometimes nagbabasa sya ng baliktad naman yung librong binabasa nya. Minsan tumatambay din sya sa kubo malapit sa patts nanghihingi ng pagkain o maiinom. She needs help and she needs someone to take care of her. May problem sya mentally. Makikita mo sya na nagsasalita kahit walang kausap, tumatawag sa cellphone kahit di gumagana yung phone na ginagamit nya. I hope mas mabantayan at maalagaan sya ng family nya. With that, Reyes has edited his post and added that the real story just made the mocking worse. Edit: Some people have messaged me saying that they know who she is and that she has a mental disability. Well, if you know her, know that she has a mental disability, and still made fun of her on social media, that’s even WORSE.